Olympic qualifiers hit Copper Mountain in Colorado this week for halfpipe and big air skiers and snowboarders. Male and female competitors from countries around the globe will square off in U.S. Ski and Snowboarding’s annual Grand Prix World Cup event, but this year the competition will be fiercer amongst one another for the Americans as they try to qualify for the Olympic team. Competition will be especially tight in the halfpipe. With athletes such as Olympic gold medalists Shaun White and David Wise in the field, not to mention the many talented athletes on the U.S. teams right now, expect competitors to be putting down Olympic-level runs right away in ski qualifiers starting Wednesday, Dec. 6, and snowboarding qualifiers on Thursday, Dec. 7. On the ski halfpipe side, local athlete Taylor Seaton, who grew up in Avon, will be among the top talent to look out for. Seaton finished on the podium in two World Cup events last year against the same field that will be at Copper Mountain this week, and could threaten to take the podium once again in Friday’s finals. Vail Ski & Snowboard Academy graduate Aaron Blunck, of Crested Butte, will also be going big as the reigning X-Games champion. The incentive for Americans to make the halfpipe podium at Copper on Friday and Saturday is especially high this year because of the way the Olympic team’s qualifying criteria is set up. And Shaun White is not actually on the snowboarding team, to add even more competition for snowboarders. But White will definitely be in the mix this year; he reminded everyone of that fact at the final Grand Prix of last season, which he won, also while not a member of the team. Wachendorfer finished runner-up to White in that event, which was the best finish of the 21-year-old’s career. Wachendorfer was only on the rookie team at the time (he was named to the pro team at the end of the season), which serves as a reminder that the U.S. can always produce surprise competitors from the lower ranks, as well. 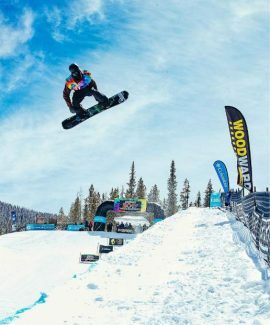 Edwards snowboarder Zoe Kalapos is another Edwards local for fans to watch this season; Kalapos is a member of the rookie team and will be looking to make a statement. The field will be deep with competitors from Canada, France, Japan and a host of other countries known to produce good halfpipe athletes. Only 10 halfpipe skiers and snowboarders on the men’s side and six on the women’s side will make it to finals. For that reason, spectators can expect qualifiers on Wednesday and Thursday to be as good a show as the finals. Those qualifiers start at 8:30 a.m. Wednesday and Thursday. Halfpipe ski finals are scheduled for 11 a.m. on Friday, with halfpipe snowboard finals scheduled for 11 a.m. Saturday.